Welcome to the Tender Belly 2018 Holiday Gift Guide. We put together some of our most popular bacon, ham, & pork products to help make your holiday shopping easier. Have a look around and make someone’s holiday special with gifts from Tender Belly. Whether enjoying with your family and friends, or giving as a gift, Tender Belly pork products are a delicious way to enjoy the holiday season. Classic holiday hams, Tender Belly style. Tender, juicy and deliciously divine swine. 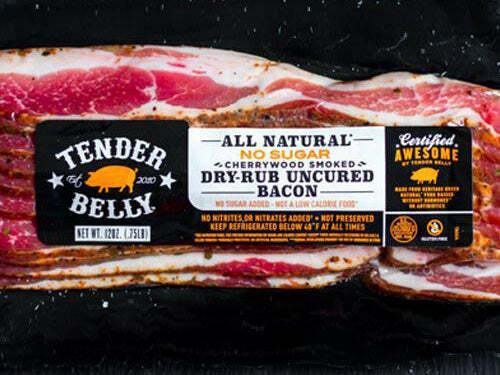 Delicious Tender Belly Bacon, but without the sugar. A great gift for friends who avoid carbs. Can’t decide what to get for that certain someone? Bacon-a-friend (or loved one) with an e-gift card and deliver Tender Belly goodness to their inbox. Looking for the perfect corporate gift or something special for the brother-in-law? How about a custom Yeti Tundra 45 cooler filled with delicious Tender Belly products? Literally the coolest gift you could give. THE BEST DAMN BACON, DELIVERED MONTHLY. The ultimate gift for bacon lovers. 4lbs of delicious Tender Belly bacon delivered monthly for up to a year!